Note: This feature is currently for live transcoding users only. 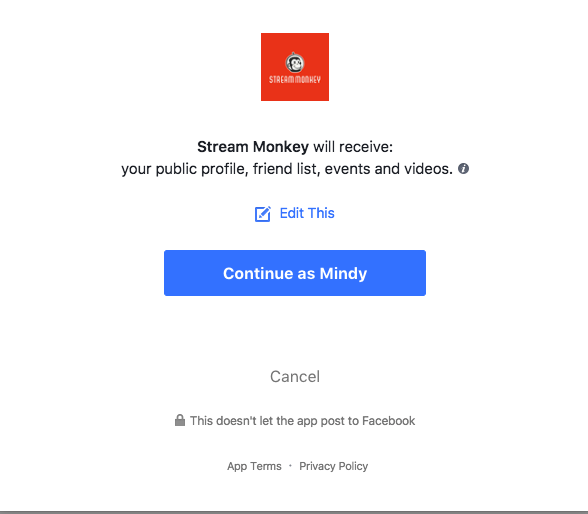 Before you can send your transcoder stream to Facebook you'll need to connect your Stream Monkey account to your Facebook account. First you'll go to the Dashboard, click on Account, then Integrations. Click on Authorize your existing Facebook account. You will see a log in screen to your Facebook account, and it will ask if you'd like to continue. It will continue to ask you permissions, who you would like to see your posts, ect. After you finish authorizing, your account will be connected! Next, follow the steps here to connect your transcoder to Facebook Live.